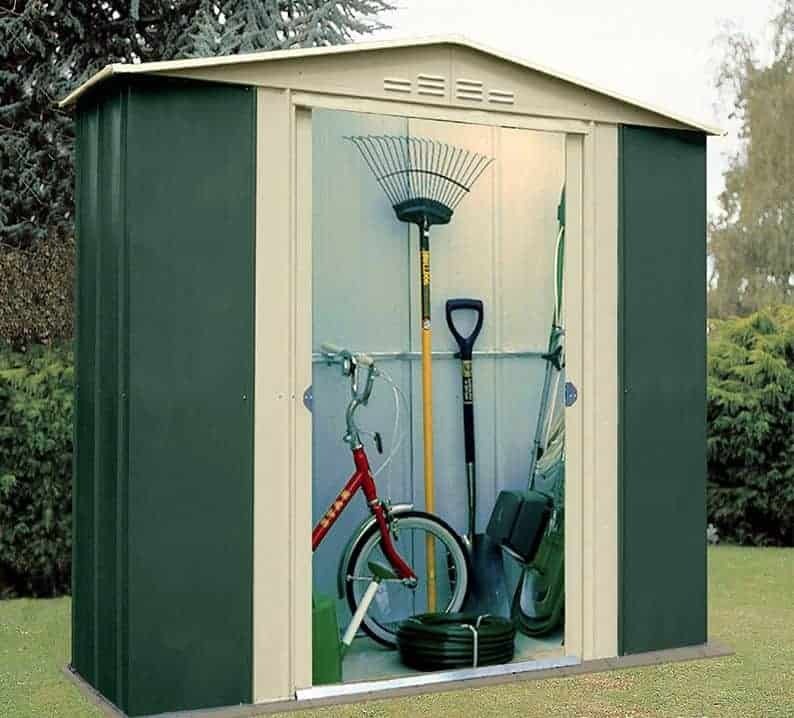 This cuboid metal shed is an ideal storage space for a garden, as it’s packed with features that make it stand out from its competitors. One thing we particularly liked is the height of its eaves and doorway, meaning that we didn’t have to bend down as we often do when going in and out of metal sheds. The double sliding doors also give wide access so it’s easy to get tall, wide or bulky objects into storage. The apex roof at the shed’s summit sees rain bounce off and run away, and that’s not the only water repellent feature. The cladding is hot dipped galvanised and then coated with paint, inside and out. The effect of this is that the shed is very resistant to rust so will retain its attractive looks for many years after purchase. In fact, a 20 year warranty is offered against perforation caused by rust. Thanks to its spacious design, we felt very comfortable when inside the shed, and this is helped by the ventilation provided through the gables. 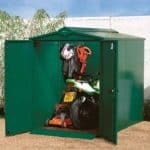 It means that there’s a plentiful supply of fresh air inside, and it can also help to fight the condensation that all metal sheds can be prone to. We found this metal storage shed very pleasing on the eye, thanks to its mainly green colouring which complements a garden background, and thanks to its uniform dimensions. We also found the almost square shape of the base advantageous when it came to storage space, as it’s easy to manoeuvre objects around, meaning that every inch can be utilised. Extra space, and extra headroom, is provided by the apex roof which is painted in a cream or off white, colour. The ridge height is 1.93m and the eaves height is 1.78m. The external dimensions of the shed are a width of 1.75m, on the side with the door, and a depth of 1.71m, although the roof overhang gives extends these measurements to 1.83m. 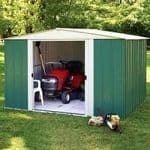 Keep these dimensions in mind when finding a flat area in which to position the shed. We often find that metal sheds in this price range have thin and lightweight cladding, and this was certainly the case here as the cladding was thinner than we often see on metal sheds. There were two factors in its favour however: the frame is substantially thicker, and the core metal has been hot dip galvanised. The end result was a surprisingly stable shed, and so we wouldn’t worry about it being installed in an area where it could be exposed to winds. Whilst we expected there to be no floor included, we were disappointed that Shed Baron don’t supply an anchor kit as standard. It means that the owner will have to purchase an extra set of screws even if they simply want to fix it onto a pre-existing area of concrete. On the plus side, however, there are two flooring kits available as optional extras, which we liked. One of the greatest advantages of a metal shed, we find, is that they don’t need to be treated with preservative on a yearly basis. That saves the customer considerable time and money, especially as this shed is guaranteed not to have rust damage for at least 20 years. It’s the superior quality galvanised cladding which allows this generosity on the part of the manufacturers, and we were pleased to see that they provided a warranty that’s twice as long as some that we see on other metal sheds. The double sliding doors were reassuringly solid, and they moved freely along the rails hidden inside the shed. The width of 0.69m isn’t particularly wide for double doors, but still allowed us to move objects in and out easily, particularly with the aid of the integrated full width ramp. 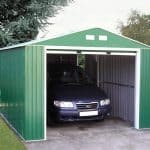 We were especially pleased with the door height of 1.7m which compares very favourably with many other sheds we review. Whilst there are no windows as standard, they can be added as optional extras. Customers have the choice of adding a sliding window or a skylight, an ideal solution if they plan on spending lengthy periods inside the shed. The lack of windows may necessitate the need to use an artificial light source such as a torch, but it also greatly adds to the security of the shed by hiding its contents from the outside world. From a security point of view we were also happy that the doors seemed solid and that the handles were holed to accept a padlock, although it would have been nice to see a padlock included along with the shed. Two extras that we really liked were the window and skylight. Both of these allow a good amount of natural light into the shed, which can then be transformed into a miniature workshop. The glazing on both is made from styrene, so you won’t have to worry about it being weak or shattering. From the galvanised cladding to the immaculate paintwork, we could tell instantly that this was a shed of very high quality. There’s nothing worse than the premature appearance of rust on a metal shed, but that’s not something you’ll have to worry about here. It comes with a 20 year warranty, but we wouldn’t be surprised if it lasted even longer. 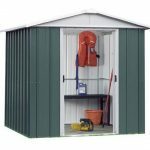 This is one of the smallest sheds in Shed Baron’s Grandale Six range, but it still offers a plentiful amount of storage space thanks to the apex roof and relatively tall eaves. Between two of us we took just under four hours to assemble this shed. Because it’s lightweight you’ll find the parts easy to manipulate, with the roof the only component likely to provide any difficulties. 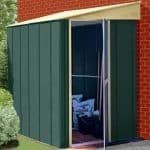 Adding one of the floor kits and a window option can significantly increase the overall cost, but we feel the basic shed plus optional Hilti screws set represents very good value for money. 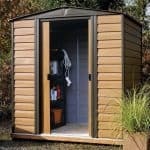 Final Thoughts: We recommend this shed to anyone who is looking to increase their storage options in the garden, but only has an area of around six foot square to accommodate it. Thanks to its height you can store more inside than you might think at first site. This gives it storage versatility that can also be enhanced with the purchase of optional corner or rear shelving. We liked the strong ramp that comes as standard, and it’s especially useful if you will be bringing heavy gardening supplies, such as soil or aggregate, into or out of the shed using a wheelbarrow.